Great Britain's Joe Clarke and Fiona Pennie have won the final two provisional places in the Great Britain slalom squad for the Rio Olympics. Day three of competition at the Lee Valley White Water Centre saw head-to-head races in the K1 with Clarke taking the men's slot and Pennie the women's. 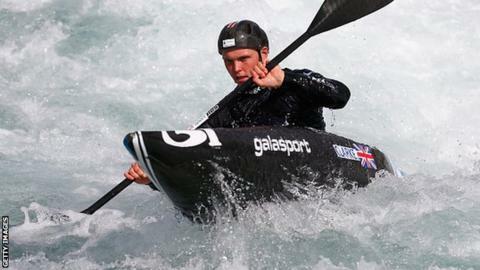 David Florence and Richard Hounslow secured their places over the weekend. Team GB's official selections for Rio 2016 will be confirmed by the British Olympic Association on 4 November. Clarke's final run of 86.84 seconds, the fastest time on Monday, saw him rise from third place. The 22-year-old, from Staffordshire, edged out Huw Swetnam and Bradley Forbes-Cryans on a countback. Pennie lost out to Lizzie Neave for the sole K1 women's spot for London 2012 but the 32-year-old Scot turned the tables this time with a fastest run of 102.78 seconds to deny Neave, who missed a crucial gate in the closing stages.